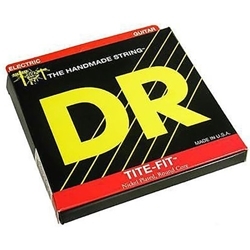 DR Tite-Fit electric guitar strings are designed using DR's finely tuned hand-crafted process. Founded by Mark Dronge in 1989, DR has taken their craft to heart in order to create a quality string used around the world. While machine-winding may be faster, DR strings are handmade so that each string is more accurately wound and free of inconsistencies. With a patented coating technique, DR strings provide excellent intonation and bright, clear sound. No matter which guitar you're playing, DR Tite-Fit electric guitar strings are right for you!